The cell plasma membrane serves as a nexus integrating extra- and intracellular components, which together enable many of the fundamental cellular signaling processes that sustain life. In order to perform this key function, plasma membrane components assemble into well-defined domains exhibiting distinct biochemical and biophysical properties that modulate various signaling events. Dysregulation of these highly dynamic membrane domains can promote oncogenic signaling. Recently, it has been demonstrated that select membrane-targeted dietary bioactives (MTDBs) have the ability to remodel plasma membrane domains and subsequently reduce cancer risk. In this review, we focus on the importance of plasma membrane domain structural and signaling functionalities as well as how loss of membrane homeostasis can drive aberrant signaling. Additionally, we discuss the intricacies associated with the investigation of these membrane domain features and their associations with cancer biology. Lastly, we describe the current literature focusing on MTDBs, including mechanisms of chemoprevention and therapeutics in order to establish a functional link between these membrane-altering biomolecules, tuning of plasma membrane hierarchal organization, and their implications in cancer prevention. This work was supported by the National Institutes of Health (NIH) grants R35CA197707 and P30ES023512, the Cancer Prevention Research Institute of Texas (CPRIT), and funds from the Allen Endowed Chair in Nutrition and Chronic Disease Prevention. Natividad Fuentes is a recipient of a Predoctoral Fellowship in Pharmacology/Toxicology from the PhRMA Foundation and the National Science Foundation Texas A&M University System Louis Stokes Alliance for Minority Participation (TAMUS LSAMP) Bridge to the Doctorate Fellowship (HRD-1249272). Alfredo Erazo-Oliveras is a recipient of the 2017 Ford Foundation Postdoctoral Fellowship from The National Academies of Sciences, Engineering and Medicine and the National Institutes of Health-National Cancer Institute (NIH-NCI) Research Supplement to Promote Diversity in Health-Related Research Award (3R35CA197707-02S1). Grecco, Hernán E., Schmick, M., & Bastiaens, Philippe I. H. Signaling from the living plasma membrane. Cell, 144(6), 897–909, https://doi.org/10.1016/j.cell.2011.01.029. Chabanon, M., Stachowiak, J. C., & Rangamani, P. (2017). Systems biology of cellular membranes: a convergence with biophysics. Wiley Interdisciplinary Reviews. Systems Biology and Medicine, 9(5). https://doi.org/10.1002/wsbm.1386. Zhang, Z., Wang, L., Du, J., Li, Y., Yang, H., Li, C., et al. (2016). Lipid raft localization of epidermal growth factor receptor alters matrix metalloproteinase-1 expression in SiHa cells via the MAPK/ERK signaling pathway. Oncology Letters, 12(6), 4991–4998, https://doi.org/10.3892/ol.2016.5307. Shashkova, S., & Leake, M. C. (2017). Single-molecule fluorescence microscopy review: shedding new light on old problems. Bioscience Reports, 37(4). https://doi.org/10.1042/BSR20170031. Das, A., Brown, M. S., Anderson, D. D., Goldstein, J. L., & Radhakrishnan, A. (2014). Three pools of plasma membrane cholesterol and their relation to cholesterol homeostasis. Elife, 3. https://doi.org/10.7554/eLife.02882. Casey, S. C., Amedei, A., Aquilano, K., Azmi, A. S., Benencia, F., Bhakta, D., et al. (2015). Cancer prevention and therapy through the modulation of the tumor microenvironment. Seminars in Cancer Biology, (35 Suppl), S199–S223. https://doi.org/10.1016/j.semcancer.2015.02.007. Gowrishankar, K., Ghosh, S., Saha, S.C, R., Mayor, S., & Rao, M. (2012). Active remodeling of cortical actin regulates spatiotemporal organization of cell surface molecules. Cell, 149(6), 1353–1367, https://doi.org/10.1016/j.cell.2012.05.008. Llado, V., Lopez, D. J., Ibarguren, M., Alonso, M., Soriano, J. B., Escriba, P. V., et al. (2014). Regulation of the cancer cell membrane lipid composition by NaCHOleate: effects on cell signaling and therapeutical relevance in glioma. Biochim Biophys Acta, 1838(6), 1619–1627, https://doi.org/10.1016/j.bbamem.2014.01.027. Zhang, L., Habib, A. A., & Zhao, D. (2016). Phosphatidylserine-targeted liposome for enhanced glioma-selective imaging. Oncotarget, 7(25), 38693–38706, https://doi.org/10.18632/oncotarget.9584. Nautiyal, J., Banerjee, S., Kanwar, S. S., Yu, Y., Patel, B. B., Sarkar, F. H., et al. (2011). 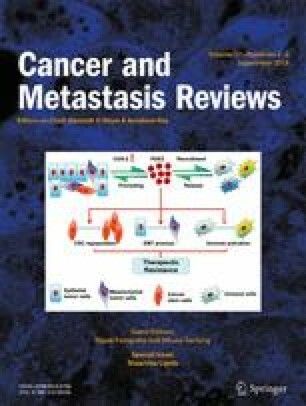 Curcumin enhances dasatinib-induced inhibition of growth and transformation of colon cancer cells. International Journal of Cancer, 128(4), 951–961, https://doi.org/10.1002/ijc.25410. Fuentes, N. R., Kim, E., Fan, Y. Y., & Chapkin, R. S. (2018). Omega-3 fatty acids, membrane remodeling and cancer prevention. Molecular Aspects of Medicine. https://doi.org/10.1016/j.mam.2018.04.001. Chan, D. W., Mak, C. S., Leung, T. H., Chan, K. K., & Ngan, H. Y. (2012). Down-regulation of Sox7 is associated with aberrant activation of Wnt/b-catenin signaling in endometrial cancer. Oncotarget, 3(12), 1546–1556, https://doi.org/10.18632/oncotarget.667. Oren, O., & Smith, B. D. (2016). Eliminating cancer stem cells by targeting embryonic signaling pathways. Stem Cell Reviews. https://doi.org/10.1007/s12015-016-9691-3.